We're a gas distribution company, which means we deliver natural gas to your home or business...sort of like picking up a package and then delivering it to you. Check out this short video to learn more about what we do and which pipelines you're responsible for as a customer! Peoples has served customers in southwestern Pennsylvania since 1885, and its history extends to the earliest days of the natural gas industry in the United States. Our company provides service from the Transmission system to the Distribution system, through a series of pipelines and stations, all the way to the customer’s meter. Pennsylvania counties we serve are: Allegheny, Armstrong, Beaver, Blair, Butler, Cambria, Clarion, Clearfield, Fayette, Greene, Indiana, Jefferson, Lawrence, Mercer, Somerset, Venango, Washington, and Westmoreland Counties. Peoples also serves 14 counties in North Central West Virginia and 10 counties in Eastern Kentucky. Natural gas is an abundant energy source, found deep beneath the earth’s surface. It is odorless, colorless, and produces very few emissions. It is generally considered to be the cleanest fuel because of its clean-burning qualities. Due to its ease of use and positive environmental attributes, natural gas use is expanding to electrical power generation, cooling, and as fuel for natural gas vehicles (NGVs). Natural gas provides about 24% of all the energy used in the United States. Gas utilities serve more than 60 million residential, commercial, and industrial customers through underground pipelines. It is the most popular energy used for home heating. According to statistics from the National Transportation Safety Board, natural gas pipelines are the safest method to transport fuel. The natural gas delivery system has the best safety record of all energy delivery systems, and it is our mission to uphold the highest safety standards as we get gas to you. This video provides an overview of where natural gas comes from, and how it is delivered to customers. 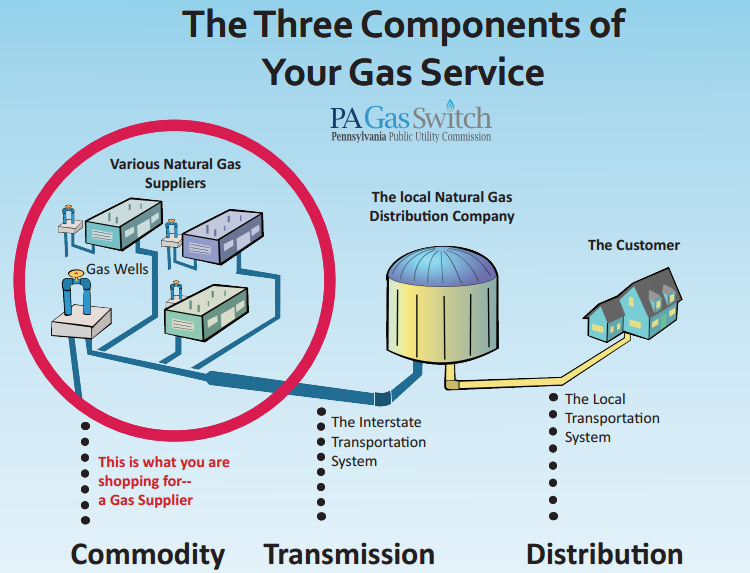 Looking to start natural gas service in your home or business? Please contact Peoples Customer Service Center at 1-800-764-0111 from 7:00am - 5:00pm, Monday to Friday. You're also welcome to fill out our Contact Form, and we'll get back to you as soon as possible.